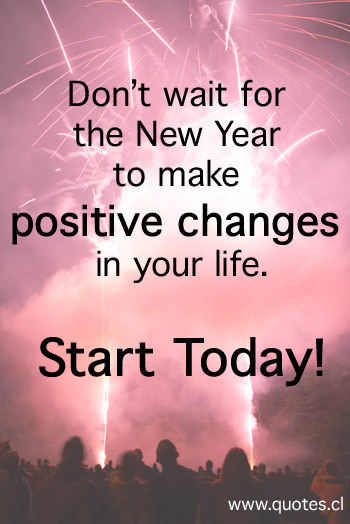 Don’t wait for the New Year to make positive changes in your life. Start Today! Why do people always wait for the New Year to make positive changes in their lives? People have a tendency to put things off. The comfort of putting things off until a future date means you won’t have to deal with the situation now. The problem is, that situation will still be there tomorrow, next week and most likely even next year. UNLESS YOU DO SOMETHING… NOW. But, if I leave the thing I want to change until later… it might be easier, right? Um, no. It will be difficult now just as much as it will be later. Have you ever noticed how difficult it is to start doing something that you don’t want to do? Moments before you start doing it you suddenly become tired or your mind looks for a million other excuses to avoid starting it. Once you actually begin the activity, it isn’t as bad as it seems, and then over time, it can actually become easier. That’s why many people use the excuse of New Year’s resolutions as the time to start these positive changes, because it is at a more comfortable future date, not the uncomfortable now. So stop leaving changes in your life until later. If you really want positive things to start happening in your life, you had better start today! I Like this short note. Yes, we can change today but we are waiting to a new year.